A rendering of the proposed development provided by the architect, Zisong Feng. 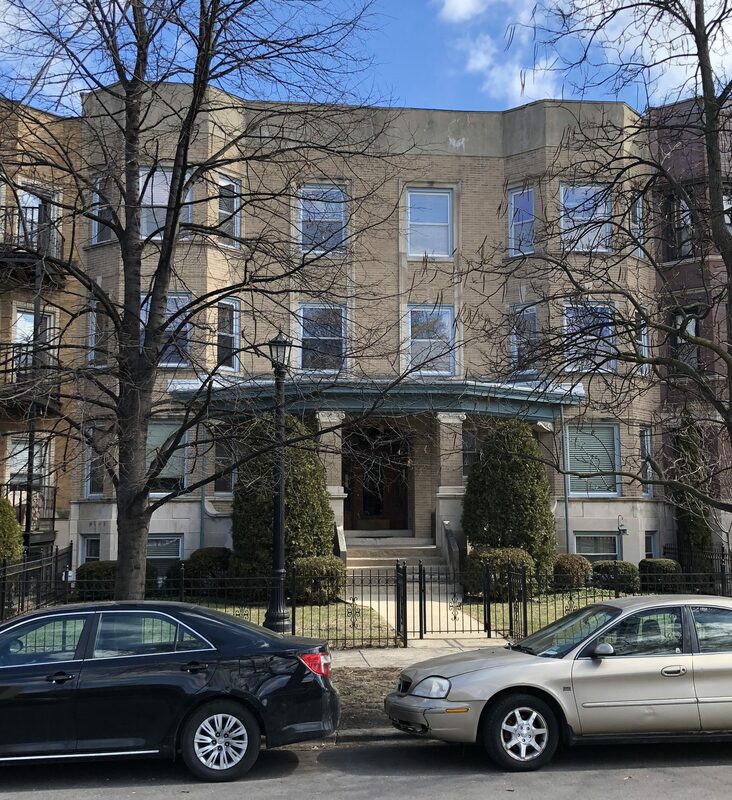 A proposed residential development that would have brought 50 mixed-bedroom apartments and 11 townhomes to an empty lot in Uptown has been stalled by 46th Ward Alderman James Cappleman and the Department of Planning and Development for being “too dense”. The proposal is less dense than neighboring buildings, and the number of new households it proposes would server bolster the reason for spending $200 million to reconstruct the Wilson CTA station. Streetsblog reported on the development after a community meeting last July due to its mixed bag of parking accommodations and request for a new street-facing curb cut. The developer planned 25 parking spaces for 50 rental units, a 50 percent reduction from what the zoning code requires. However, the townhomes would each have a 2-car garage, bringing the total number of parking spaces for the site to 47. While the townhome parking would be alley-accessible, the parking garage for rental units would be accessed via a new 22-foot curb cut on Malden St.
Curb cuts are troubling as they introduce a new vehicle conflict point along the sidewalk, and no curb cuts currently exist on the 4600 N block of Malden St. However, neighbors were less concerned with the safety impact of a curb cut, instead rejecting it on the basis that it would remove free street parking spaces. The curb cut is just one of two reasons that the ward office stated the project is on hold. Members of neighborhood block clubs are principally opposed to the amount of density proposed for the site and the developer’s request for a curb cut. Tressa Feher, 46th Ward Chief of Staff, stated that the Department of Planning and Development agreed with local opposition to the project on the basis of density. Alder. Cappleman originally made the announcement that it was “placed on hold” by DPD on March 2, 2018, in the ward newsletter “due to the density and curb cut in the front”. The developer is seeking a zoning change from RT-4 to RM-4.5, just one step upward in the zoning code, which permits additional height and density. While the developer would not have been able to construct the originally-proposed building under the existing zoning code, it is also true that many of the buildings on this street would also not have been built under the existing zoning code. With the recently renovated and capacity-expanding ‘L’ station opening at Wilson, the ward and the city should be doing everything possible to make the most out of this 3-year, $203 million investment. A longtime vacant lot just three blocks from the station is a great location to do so, and would have brought dozens of new residents to a neighborhood that is making several investments in sustainable transportation infrastructure and placemaking, such as the new plaza being constructed at Racine and Broadway. The ward office’s claim that the Department of Planning and Development finds the development too dense doesn’t make a lot of sense when the proposed development is compared to neighboring buildings. In fact, for a building with 61 proposed units on five lots totalling about 38,690 square feet, the development would have been several times less dense than many existing buildings on Malden St. 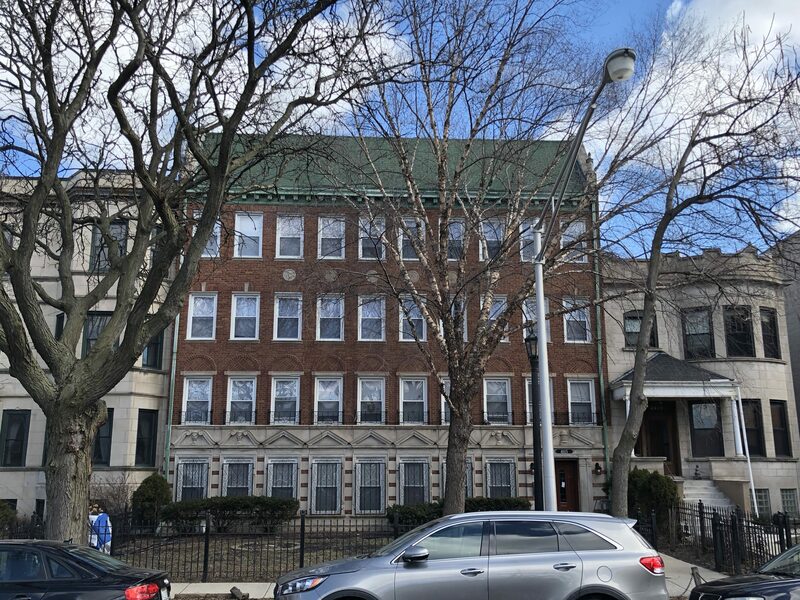 When standardized for the typical Chicago lot that’s 3,125 square feet, the proposed development is 4.9 units per standard lot size (a concept created by Daniel Hertz). For example, the ubiquitous two-flat graystone is two units per standard lot size. 4615 N Malden, across the street from the proposed development, has 40 units, or 16.3 units per standard lot size. 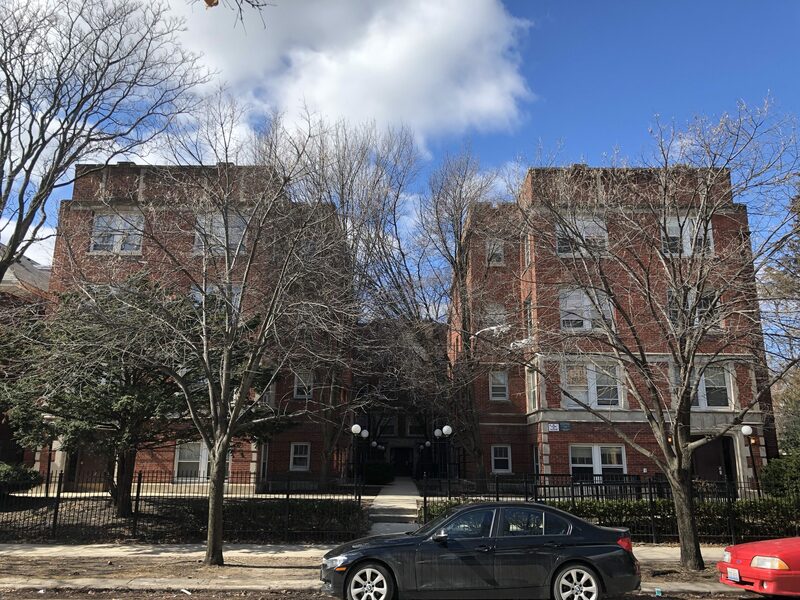 4635-37 N Malden, also across the street, has 16 units, or 6.3 units per standard lot size. 4520-28 N Malden, one block south, has 58 units, or 12 units per standard lot size. 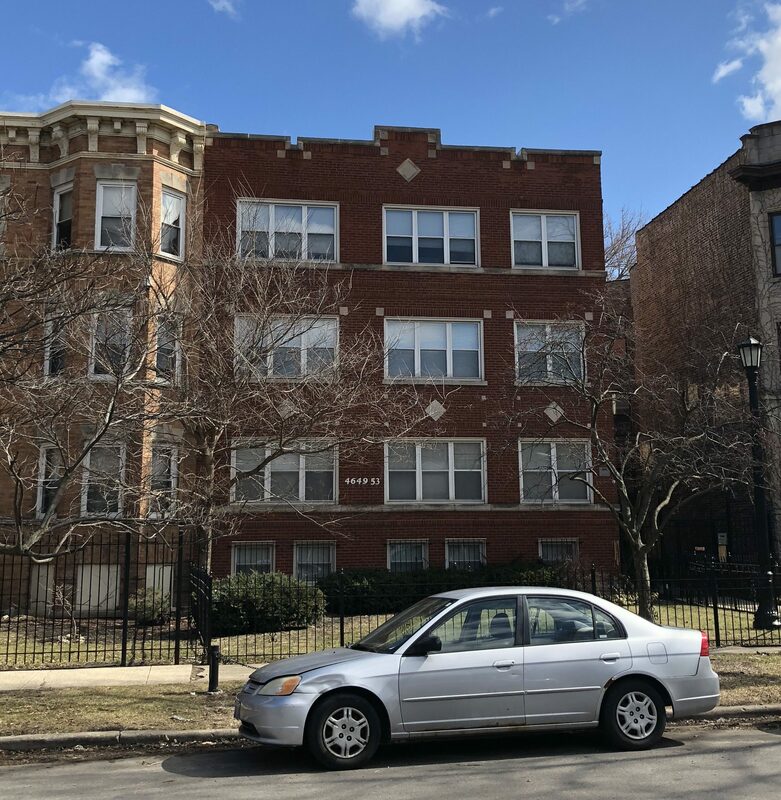 4649-53 N Malden, on the same block, has 24 units, or 9.2 units per standard lot size. These existing buildings were built between 1901 and 1930. In the 1923 and 1927 versions of the zoning code, the city permitted buildings as high as 132’ on Malden St, as well as adjoining streets, due to its inclusion in a “volume district”. In the 1957 zoning code, established decades after the construction of the above buildings, the street was zoned R5, which allowed a floor-area ratio (FAR, which is how the zoning code measures density of households on a lot) of 2.2. The proposed development has a lower floor-area ratio, making it less dense than what was allowed in 1957. The developer was seeking to rezone the lot for RM-4.5 zoning, which would have brought its FAR allowance up to 1.7 from 1.2, still below the 2.2 FAR permitted for much of the last century when many of the buildings on the block were constructed. When most of the existing buildings on Malden and elsewhere in this neighborhood were originally built in the early 20th century, the neighborhood was growing. The Wilson ‘L’ station opened in May 1900, and many buildings were constructed in the decades thereafter. Putting the existing neighborhood zoning in historical context is important when we consider that Uptown is growing again, especially with the reconstruction and expansion of the ‘L’ station. It’s possible that neighbors who complain about the density of a new development are in fact living in developments that are technically more dense. While the permitted density has decreased over the decades, it is clear that Uptown is becoming a more desirable neighborhood. The city is making multiple investments not only in placemaking but also in terms of transportation capacity. The development, as originally proposed, is hardly pushing boundaries in terms of density, historically and currently speaking. Without allowing this kind of density back into the neighborhood, the city’s investments will not realize their full potential. I live in Uptown and I support the development but I despise the curb cut. This part of Uptown (Sheridan Park) has alleys for each side of each street and there’s no reason the curb cut should be allowed. Honestly, I think the city should turn down any development that builds curb cuts where there’s alley access, it’s a piece of infrastructure, so use it. Chicagoan – I think the curb cut was one of the things that the developer committed to eliminating in the next iteration of this project. I agree with the author that the high density buildings around this, along with the TOD / proximity to the Wilson L stop, make this development a no brainer at this density. Much better than an empty lot. I just hope the opposition to the curb cut didn’t scare the owner / developer away! This is my street, went to the dysfunctional meetings. It doesn’t surprise me that Cappleman’s circle would be against a curb cut because it removes a couple spaces. It would never occur to them that there is a playlot right there, better reason to oppose it, never came up. The “process” that Ald. Cappleman uses for zoning has changed constantly, it is utterly confusing and dysfunctional, the word “rudderless” comes mind. Either way… Cappleman is the most car-friendly Alderman who swears he is a bike advocate. The most pro-development Alderman who bungles zoning issues. The developer has owned those lots for decades, pretty sure they are not running away. I’m confused. How does the playlot figure in? That in their outrage over losing a few spots, the safety of children walking to/from the play lot never factored in their opposition. I do admire the stance Alderman Pawar has taken on dense, TOD development in his ward (Specifically Lawrence Avenue). He’s happy to host community meetings, hear feedback, but he’s made it known that he’s going to welcome these kinds of projects on the commercial avenues in his ward. I just wish Alderman Cappleman would do this as well. Hey Littleton, I didn’t realize it was you who did the public art at the Buena Avenue underpass, I rode my bike through there last night and it looks so great. So that only applies if the development has a curb cut? If there’s no curb cut, there’s no danger of traffic coming out of the driveway. That’s what I’m confused about. There can’t be a drive-way without a curb cut. Of course. That’s my point. I guess I should have written “coming out of a driveway” instead. Anyway, I would love to see this project return, and hopefully it has alley access to the parking. Thanks…going to be adding on to it very soon. It seems like as good of a reason as any to keep cars from crossing the sidewalk.